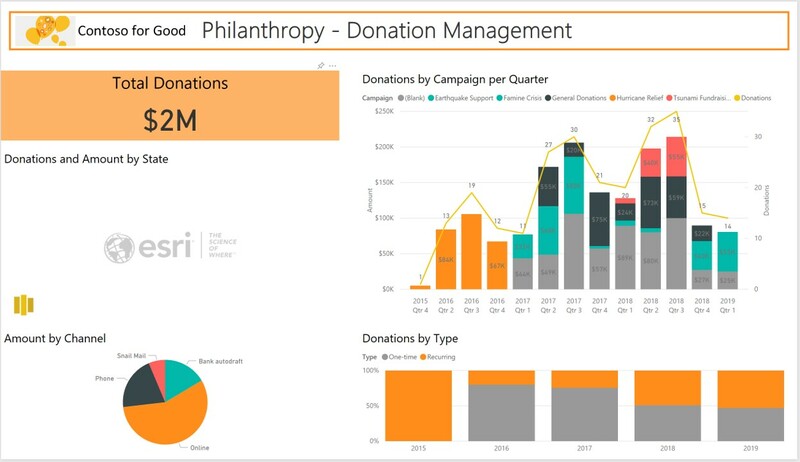 Nonprofits can use Microsoft PowerBI to manage and analyze donations and other pieces of data. Justin Spelhaug, General Manager, Microsoft Philanthropies, speaks at the inaugural Nonprofit CXO Summit in Bellevue, Washington. Team Rubicon uses Microsoft Dynamics 365 CDS to help organize its army of more than 80,000 volunteers. Nonprofits can use Microsoft PowerBI to manage volunteers and other pieces of data. As a company at the forefront of digital transformation, Microsoft is committed to bringing the benefits of technology to all. When we step back and look at challenges facing nonprofits, they struggle with the lack of technical capacity, scarcity of resources, and lack of partners and few technology solutions customized for their environment. Last fall, we announced Microsoft’s commitment to help nonprofits leverage technology for greater impact through Tech for Social Impact. This new initiative, powered by a sustainable social model where profits are reinvested into expanding support for nonprofits, is already gaining traction. This week at Microsoft’s inaugural CXO Summit we are hosting nonprofit leaders from around the world to exchange insights and practical guidance to help nonprofits achieve their missions and drive greater impact through digital transformation. We are announcing several new solutions, offers and resources, built hand-in-hand with nonprofits to meet some of their most critical needs. Collectively, these offerings put more advanced technology into the hands of nonprofits so they can increase productivity and efficiency—ultimately strengthening their impact on some of the world’s most pressing issues. We’re excited to share these new offerings, and we are laying out an ambitious agenda at the CXO Summit to deliver even more value in the future. Nonprofits typically have limited IT staff, making it challenging to maximize the full benefits of technology. Indeed, most nongovernmental organizations (NGOs) lack a comprehensive digital strategy, and nearly half of nonprofits say their infrastructure is barely keeping up, according to a 2017 Digital NGO Member Survey by NetHope. To help nonprofits jump-start their journey to the cloud, we’re announcing AzureFoundation for nonprofits. Within AzureFoundation are a series of accelerator packs, which come with prescriptive guidance, templates, blueprints and documentation designed to make it easier to adopt Microsoft Azure within a nonprofit environment. For example, the AzureFoundation security accelerator pack helps nonprofits establish a solid security framework as they implement Azure, with a dashboard to monitor all their security-related information in one place. Additional accelerator packs help nonprofits manage hybrid networks and verify the identity of users logging on to the system. Together, these accelerator packs make it easier for IT staff to follow best practices, creating a more secure foundation for growth in their journey to the cloud. To learn how AzureFoundation accelerator packs can strengthen your nonprofit’s Microsoft Azure investment, please visit our Microsoft Nonprofits homepage. We’re also introducing a nonprofit data schema on Dynamics 365 Common Data Service (CDS), which can accelerate innovation for nonprofits and developers to build solutions on top of Microsoft Dynamics 365. For example, U.S.-based consulting firm Wipfli is working with Team Rubicon to build a volunteer management system by tapping into the power of Dynamics 365 CDS, to help organize its army of more than 80,000 volunteers. The new volunteer management system will help the nonprofit more effectively leverage the skills of military veteran volunteers to help communities prepare for and respond to natural disasters. It will enable Team Rubicon leaders to see which volunteers are available at any given time and to more efficiently deploy those volunteers to impacted communities, as well as manage operations, training, equipment, donors and more. Additional benefits include the integration of insights that nonprofits will be able to gain through this model. We’re excited that many partners have already developed solutions specifically for nonprofits based on Microsoft Dynamics 365, and we encourage partners to add to the Microsoft AppSource marketplace as they complete more purpose-built solutions for nonprofits based on Microsoft Dynamics 365 CDS. In addition to the challenge of combining disparate information, nonprofits tell us they need an easy way to visualize mountains of data and identify important trends in order to increase impact. To help, we’re announcing Microsoft Power BI templates for nonprofits, a selection of Power BI templates that help illustrate how nonprofits can leverage insights and analytics in common use cases. The templates show how consolidating operational data onto a single screen within Power BI allows nonprofits to identify and analyze trends in areas like grants management, volunteer management and case management. With the ability to explore data in new and meaningful ways, nonprofits can quickly determine the best course of action to maximize impact. For example, the Ireland-based international aid charity GOAL worked with Microsoft to develop a Power BI Grants Management Template that combines donor information from Microsoft Dynamics 365, Microsoft Excel and other sources—visually presenting it as a dashboard in Power BI. With the ability to explore this information in one place, GOAL can easily identify its repeat donors as well as net improvements or losses in support. “The template gives us a helicopter view into key fundraising trends, which is going to help us better direct our fundraising efforts,” says Louise Kelly, GOAL’s IT Director. The Power BI Grants Management Template and six other Power BI templates for nonprofits, including case management, volunteer management, field resource management and donation management, are available here. We will continue to build upon our commitment to help make technology more accessible and affordable—such as existing offers like Microsoft 365 for Nonprofits, discounts on Surface Books and Surface Pros and standard nonprofit discount models. We are also excited to announce discounts for Microsoft Azure and Microsoft Dynamics 365 for Operations. For Azure, a 15 percent discount is now available through the Enterprise Agreement, and we will continue to maintain a $5,000 credit for purchases via Web-Direct. We will provide a discount on Dynamics 365 for Operations, ranging from 20 to 60 percent, depending on volume. Microsoft is committed to supporting every nonprofit in the cloud and will continue to focus on new offers and new innovations. We encourage you to explore all of our technology solutions and services for nonprofits at our Microsoft Nonprofits homepage.